In the beginning was the Word, and the Word was with God, and the Word was God. He was in the beginning with God. All things came to be through him, and without him nothing came to be. What came to be through him was life, and this life was the light of the human race; and light shines in the darkness, and the darkness has not overcome it. A man named John was sent from God. He came for testimony, to testify to the light, so that all might believe through him. He was not the light, but came to testify to the light. The true light, which enlightens everyone, was coming into the world. But to those who did accept him he gave power to become children of God, to those who believe in his name, who were born not by natural generation nor by human choice nor by a man's decision but of God. And the Word became flesh and made his dwelling among us, and we saw his glory, the glory as of the Father's only Son, full of grace and truth. John testified to him and cried out, saying, "This was he of whom I said, 'The one who is coming after me ranks ahead of me because he existed before me.'" From his fullness we have all received, grace in place of grace, because while the law was given through Moses, grace and truth came through Jesus Christ. No one has ever seen God. The only Son, God, who is at the Father's side, has revealed him. Ever since I was a teenager, I've always been amazed at the increase in Mass attendance on this day. What is it about Christmas that attracts so many more people to church? Why this day, as opposed to other days, such as Sunday Mass, which should see the church as full as it is right now? What draws persons in great numbers to church? Is it merely cultural conditioning that somehow awakens a religious instinct on this day that inspires people to come to church when they otherwise would pass this day by unnoticed? Is is familial pressure to not upset devout grandparents or siblings and to keep a false "peace" in the home during these holy days? I would like to think that it's more than that. People are still drawn to church on Christmas because they want to believe that it's all really true - that somehow, someway the Christ-child is really the hope of the human race. They want to believe that His birth ushers-in a new era of redemption, reconciliation, healing and peace. In the eyes of an increasingly secular world, the events that we commemorate this day for the 2004th time are quite illogical. In the eyes of the world, who would ever believe that 2000 and four years later, we would still be celebrating the birth of a poor child in an otherwise out-of-the-way town in one of the least prestigious provinces of the Roman Empire. And yet, the mystery of it all lies within the paradoxes of Christmas. There's what I like to call an illogical divine logic to Christmas. Consider for a moment that the story of Christmas presents us with the elderly cousin of the Savior's mother who is known to be barren until she conceives a son, who will later recognize Jesus while the two are still in the womb. We embrace a poor and unknown pregnant mother who is in a crisis pregnancy because no one will believe that she has conceived by the Holy spirit. Today, she is revered as the Queen of Heaven and Earth. Her husband is a simple carpenter of no particular sophistication or clout and yet today He is known as the Patron of the Universal Church. The king of kings is born in a stable, in a wooden manger, a setting hardly fit for an earthly king. This familiarity with wood will continue as he labors in his foster-father's carpenter's shop for the better part of His life and He will end up giving up his life at the age of 33 on a wooden Cross, another setting hardly fit for a king. There are shepherds in the fields surrounding Bethlehem, veritable "nobodies" in the eyes of the world, who are among the first worshippers of the Christ. We will later celebrate the Magi, wise men from the East, who are Gentiles and probably worshippers of pagan gods, offering homage to the Son of the one true God. Then, there is a blood-thirsty local ruler in the person of Herod who enacts the brutal murder of hundreds of infants and children for fear that his rival is in his midst, even though this supposed enemy carries no sword and has never made a political statement of aggression. This illogical divine logic is precisely what draws millions to the crèche. Christmas is an invitation to faith - it is not merely a celebration of divinity taking on humanity. It is more than that - it is an invitation for us to believe that God, at times directly contradicting the ways of the world, is alive and well and present in the world and that He has come to save us from our sins and from ourselves. We come to Mass on Christmas because we still want to believe that the illogical logic of God somehow makes sense in our heart of hearts. We want to come and see and re-learn that the key to being great in the kingdom of God lies in our desire and capacity to be as small and hidden and as obscure as Mary, Joseph and the baby Jesus were in the events that we commemorate. 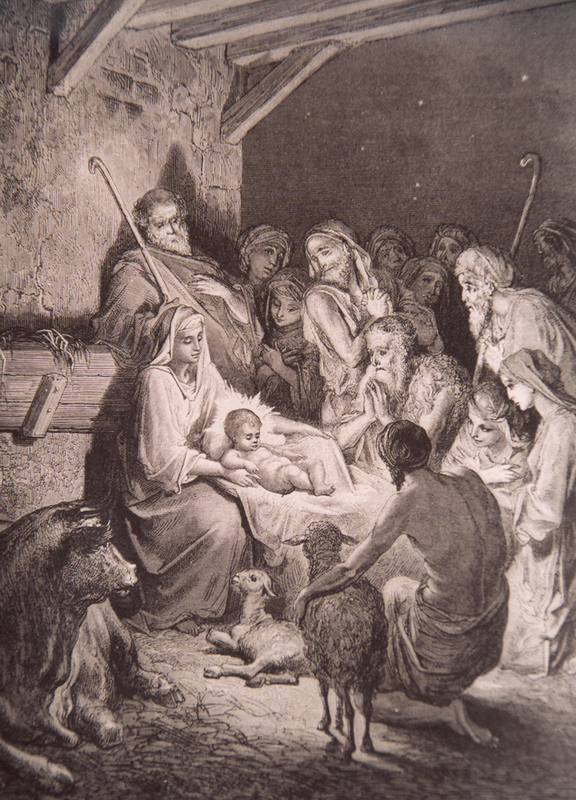 Secularists and those who would attempt to stamp-out the very word of "Christmas" from the fabric of our national ethos are confounded by the fact that deep down within each of us is a desire for God - a desire for the transcendent God who comes to us, not in abstract ideas or philosophical musings, but now - in the form of an innocent, vulnerable child full of purity, poverty and yet serene majesty. The Christ-child once inspired a spiritual writer to comment, "By making Himself such a tiny infant, He cries out to you: trust, intimacy! Don't be afraid of me! Come to me! Have no fear in the presence of such a gently Child. He is indeed your God, but so very, very gentle and with such a lovely smile. . . Let your hearts overflow with tenderness, love and trust. (Charles de Foucauld)." Christmas invites us, in faith, to embrace the seemingly impossible. The Christ-child beckons us to believe that God is no longer distant - now God has humbled Himself to take on our existence in all things but sin. He has made Himself vulnerable in order to make us strong. He has made Himself poor so that we may be rich. He has made Himself humble so as to confound the proud and arrogant. And He has made Himself our ransom so that we might have life everlasting. Indeed, God has actually condescended to take on our humanity. May we never forget the awesomeness of this mystery! No other world religion makes this kind of claim - that divinity would take on humanity in order to redeem it. This one life reminds us that all human life is precious and that every person counts and that one life can make all the difference in the world. This is perhaps best summed up in a composition called, "One Solitary Life," He was born in an obscure village. He worked in a carpenter's shop until He was thirty and for three years He was an itinerant preacher. He never wrote a book. He never held an office. He never owned a home. He never had a family. He never went to college. He never traveled more that 200 miles from the place where He was born. He never did any of the things that accompany man's idea of greatness. He had no credentials but Himself. While still a young man, the tide of popular opinion turned against Him. His friends ran away. One betrayed and another denied Him. He was turned over to His enemies. He went through a mockery of a trial. He was nailed to a cross between two thieves. While He was dying His executioners gambled for the only piece of property He owned on earth - His coat. When He was dead, He was taken down and laid in a borrowed grave. Twenty centuries have come and gone and today He is the central figure of the human race. All the armies that ever marched, and all the navies that were ever built, and all the parliaments that ever sat, and all the kings that ever reigned, put together, have not affected the life of man upon earth as powerfully as has this one solitary life. May the illogical divine logic of God's holy and divine wisdom settle your heart this Christmas and fill you with tremendous hope that nothing is impossible with God - in spite of our sins, He has indeed come to save us! The impossible is not very possible and real. He comes not in the splendor of an entourage or ornate palace - He comes to make His dwelling among us in poverty, humility and peace. May the Blessed Virgin Mary draw you closer to adore Her son so that you may know that God is truly with us, that His love endures forever, and that it is indeed all true, not only at Christmas and Easter, but everyday and definitely every Sunday at 10:30 in the morning.